An epic weekend deserves epic savings. Book with United Vacations® by February 14 and choose from loads of exclusive hotel deals, including savings up to 40%, complimentary dining, $100 in resort credit and many more.1 Plus, you can save up to an additional $250 on the entire package with promo code VEGASSALE5.2 It definitely is your lucky day. The iconic Caesars Palace recently opened the luxurious new 587-room Julius Tower, The Laurel Collection rooms in the Augustus Tower with a contemporary update. Enjoy oversized residential-styled living spaces with private terraces and breathtaking views of the Las Vegas skyline. Guests of Encore will enjoy all of the amenities and indulgences of Wynn Las Vegas plus an array of accommodations, signature restaurants and more. Relax at the Grand Spa, Grand Pool Complex, and Wet Republic, or indulge in gourmet cuisine at Craftsteak, Pub 1842, or Joël Robuchon. Fronting all of the sparkling lights, dining, entertainment and attractions of the Las Vegas Strip, this hotel offers the perfect blend of comfort, convenience and fun. Experience eclectic food options, shop till you drop at the Miracle Mile Shops, and be sure to cap off the night at one of the resort’s high-energy bars. Experience delicious dining at signature restaurants, indulge with a relaxing treatment at the dynamic spa and then hit the casino for world-class gaming excitement. Capturing the romance of Italy, this resort is redefining Las Vegas with outstanding luxury and European charm. Convenient to all the dining, entertainment and gaming action the Las Vegas Strip has to offer. Westgate Resorts focuses on making lasting memories for you, your family and your friends. Has an on-site Monorail station for convenient access up and down the famous Las Vegas Strip. The Forbes Travel Guide Five-Star award-winning Wynn Las Vegas sets the standard as one of the top luxury destinations in Las Vegas. 1Savings up to 40% valid at Caesars Palace, Complimentary breakfast buffet valid at Wynn Las Vegas, $100 in resort credit valid at The Cosmopolitan of Las Vegas. All savings will be reflected in system prices at time of booking. Valid on new reservations made between 6 pm CST on 1/31/19 and 6 pm CST on 2/14/19 for travel 2/1/19 - 12/15/19. 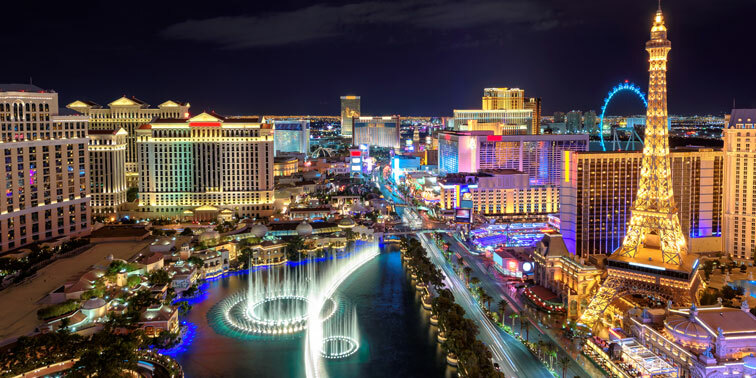 2Promo code VEGASSALE5 is valid for travel 2/1/19 - 12/15/19 for air/hotel and hotel only packages to Las Vegas, 1-night minimum stay required. Save up to $250 per reservation based on a 5% discount on the hotel portion of the vacation. Valid on new bookings made between 6 pm CST on 1/31/19 and 6 pm CST on 2/14/19. Must enter promo code VEGASSALE5 at time of booking.